Back in February we covered UltraViolet, and looked at the process for redeeming a code for newly purchased media. For existing content, a service known as disc-to-digital can be used to obtain a UV license. I decided to give that a try and take a look at how things have progressed with the UltraViolet consortium. Fox has become a member. The BBC is now supplying TV shows in UV format. DTS sound is now supported. No devices have yet come to market that allow existing content to be used to obtain UV licenses. Back in January, Samsung launched the BD-E6500 Blu-ray player, announcing to the world that it had a disc-to-digital capability: “When consumers insert an eligible physical disc into a 2012 Samsung Blu-ray player and select the Disc to Digital icon, they will launch the Flixster application and can easily add the movie to their UltraViolet locker for a nominal amount. If high definition versions are available, they will have the option to upgrade their standard definition movies for an additional fee.” Technically, it’s still “later this year”, so they have a few months, but the BD-E6500 still does not support this; furthermore, Samsung’s website even points the user to the Walmart method. Nobody yet offers the ability to make a physical copy. 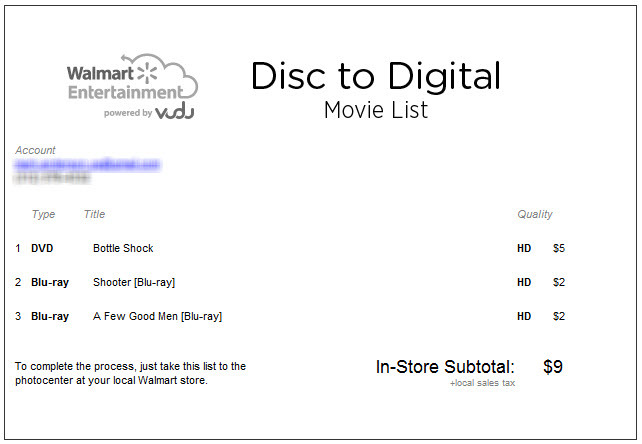 To convert a movie that you already own, you need to use a disc-to-digital service. Currently, the only way to accomplish this is to visit a Walmart store. The idea is that you take the physical discs that you own (as proof of ownership) to a Walmart and give them your UltraViolet account name. They enable a digital license for those movies and stamp the discs so that you can’t lend them to a friend so he can use them. Because not all movie studios are UV members (Disney being the major abstainer), you can’t get a UV license for any old movie. Rather than take a bunch of discs to Walmart and wait while they try and find them just to discover they are not available, you can check in advance and create you list. Start out by going to http://www.vudu.com/disc_to_digital.html and signing up. 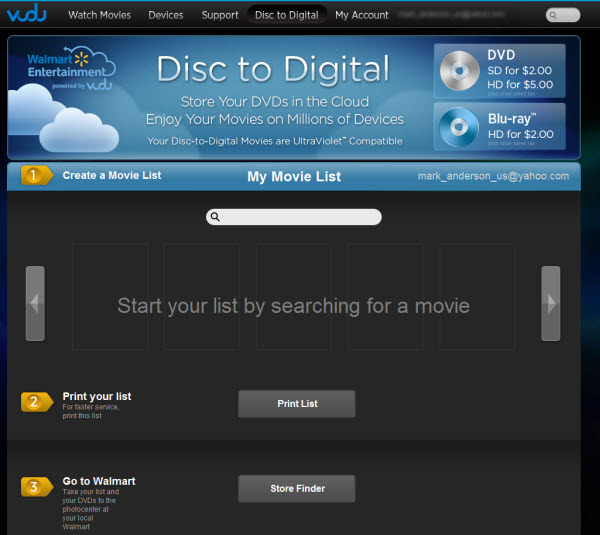 (If you already have a Vudu account, go to Vudu.com and select Disc to Digital -> convert DVD’s). The next thing is to search for a movie. This will only show movies that are eligible for UV licenses. As movies are selected they are added to the list. Curiously, some are not available in Vudu’s HDX format (see Shooter below). Next step is to print the list. So far the whole experience and process has been pretty polished and streamlined, but that’s all about to change. To complete my transaction, I retrieved the physical copies and jumped in the car to go to Walmart. I’ll be honest, I wasn’t expecting a stellar experience, but even I was shocked at the incompetence. I had a meeting near a Walmart Supercenter, so I called the day prior to ask if they offered disc-to-digital. I specifically called the photo department (the UltraViolet website was very clear on this: “Take your list and your DVDs to the photocenter at your local Walmart”). I spoke to three people on the phone, not one of them had a clue what I was talking about. As it turned out, when I got to that store, there was a big freestanding ad for UltraViolet right opposite the main counter of the photo desk. How could none of them know about the service? On arrival at the store, I asked for the photo center and was sent in completely the wrong direction. After finding it, I presented them with my list and physical movies and got 40 (yes 40) minutes of “I haven’t been trained on this”, “I can’t find the instructions”, “no-one knows the password”, and “the person who knows the password will be here in two hours”. After 40 minutes, I asked for the store manager. I told him about my phone calls and the fact I’d been waiting 40 minutes. He calmly explained (not a care in the world) to the employees, that if they couldn’t find the folder with the instructions, they wouldn’t be able to help customers, apologized to me and offered to convert my $9 worth of movies for free if I came back. $9 wouldn’t even cover my gas costs. He offered to transfer them when he figured it out and mail my discs back. There was no way I was trusting them with $50 worth of movies, so I declined. In my opinion, UltraViolet has made a huge error appointing Walmart. Being the owners of Vudu means Walmart should have the expertise, but unfortunately that doesn’t translate to the shop floor. Walmart is known for its low wages; therefore, it generally doesn’t attract top caliber retail employees. That’s fine with me, but if you don’t employ people with adequate skills, you make sure they’re trained; that written procedures are put in place; and that management makes sure they are followed. Clearly, in this store, they failed on all three counts. At this point I had no choice but to abandon my mission. Normally, I’d have given up at this point, but I did want to see the assignment through. Against my better judgment, I returned at lunch time. I met the guy who came in two hours after my original visit and was dumbfounded when he told me he didn’t know the password and couldn’t find the instructions. At this point I asked to see the store manager. Luckily, while he was off finding the store manager, a girl came to the photo center and asked if she could help. I said “only if you have the password for the disc-to-digital machine”. She said she did and that she had printed out all the instructions earlier and asked if I’d bear with her, as it was the first time she’d done it. Naturally, I agreed. 30 minutes later, she was still looking for the password. Just as I was about to leave, she managed to login and started adding my disks. I had given her the list that I printed out, but for some reason she only added 2 of the 3 movies. A colleague told her (for some reason) that I didn’t want the 3rd. After I insisted that I did want Bottle Shock and the upgrade to HD (just as it appeared on the list), she added it to the order. About 3 minutes later they were visible in my UV account. They offered me a $20 gift card as compensation, but I left the store without it, as even that seemed to be taking forever (and it’s unlikely I’ll ever set foot back ina Walmart store). The discs I took were not stamped, so I could easily lend to a friend so that they could buy the movies for $2 each if I were so inclined. Fortunately, I’m not. The initiative is gaining momentum and will hopefully continue to do so. I would hope that my Walmart experience is not the same as anyone else’s. Fortunately, you don’t have to endure this for new content that ships with a UV redemption code. Simply go to the web site printed on the coupon and enter the redemption code (as described in our initial article).